Jackson and Eileen look forward to welcoming you to our family run guest house. 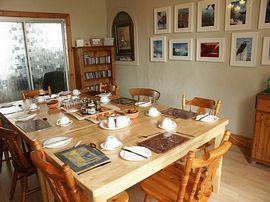 The Queens Guest House is a Victorian townhouse which still retains many of its original features and is situated in the quiet colourful Queens Terrace, 200 metres from the shorefront and only 5 mins walk from Ayr town centre. We are within easy reach of over 40 excellent golf courses and we especially welcome bowlers who wish to participate or watch the Championship bowling competitions that take place at Scotland's national centre Ayr Northfield. Ayr Northfield is only a 5 mins drive from the Queesn Guest House. From Prestwick Ariport turn left, follow main road through Prestwick into Ayr. At main King Street roundabout (Police station on right hand side) take right and then left at traffic lights. Follow the road into Ayr, over the River Ayr, along The Sandgate, straight through the mini roundabout, then take first right (Wellington Gardens will be on your left hand side) then second right onto Queens Terrace. From Ayr Central bus terminal ask for Queens Terrace which is a short walk from the station towards the seafront. From Ayr Station take a taxi (approximately 1 mile). Spring: Single prices from £28.00 per person per night. 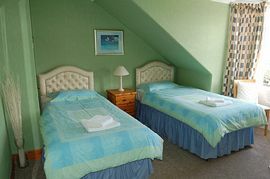 Twin/Double/Family from £25.00 per person per night. Summer: Single prices from £30.00 per person per night. 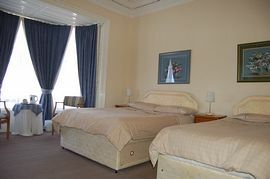 Twin/Double/Family from £27.00 per person per night. Autumn: Single prices from £28.00 per person per night. Twin/Double/Family from £25.00 per person per night. Winter: Single prices from £25.00 per person per night. Twin/Double/Family from £25.00 per person per night. Open all year, check out our webpage for special winter deals.